David's memorial service will be held at The National Arts Club in New York City on Saturday, March 10 at 1:00 PM. The address is 15 Gramercy Park South. Jackets are required for men. We are better people for having had him in our lives. David Doernberg died at his home in New York City on March 2 and his leaving diminishes our world. He was born August 29, 1967 in New Haven, Connecticut, to Ray (now deceased) and Myrna Doernberg. In addition to his mother, David leaves his adored older brother, Michael, his dear sister-in-law Lynn and two nephews, Alex and Zach (Cary, NC). Those who knew and loved Dave enjoyed watching him build a successful career as a production designer. At the start, David collaborated on music videos for such bands as Sonic Youth, Superchunk and Yo La Tengo. As his work became known, Dave was sought out for commercials and independent films. An eye for detail and an understated aesthetic are hallmarks of Dave’s memorable body of work. Though still young, David made the time to mentor other designers who admired his work and his collaborative style. Dave was especially proud of his contribution to such films as Junebug, Gummo, Palindromes and Meek’s Cutoff. David never took for granted that life is precious. Above all, he valued family and friendship. His passion for food and cooking, the ocean, nicknames, film, music, architecture, design and the Yanks provide just a small sense of a life fully lived. David traveled and as with all of life, he experienced it with joy: the beaches of Shelter Island, the slopes of Jackson Hole, camping in Big Sur, a motorcycle trip through the mountains of Northern India were most memorable. We will remember David as a devoted son, an extraordinary brother and loving uncle. Those who were fortunate to experience his unique brand of friendship will tell you how he provided encouragement, a welcoming ear, good counsel offered with humor, openness and warmth. The stamina with which he fought against a disease that would not let up has inspired strength, calm and courage in all who knew him. His memory lives on in whom he loved and all who loved him. We are better people for having had him in our lives. There will be a memorial service at The National Arts Club in New York City on March 10 and a springtime tree planting will take place in Chapel Hill, NC - date to be determined. Yesterday was an unseasonably warm day in NYC. Myrna and I took a long walk which included a trip to Chelsea Market. The tuna at The Lobster Place looked really good, so I got a small piece for dinner. It was easier to make than you think. 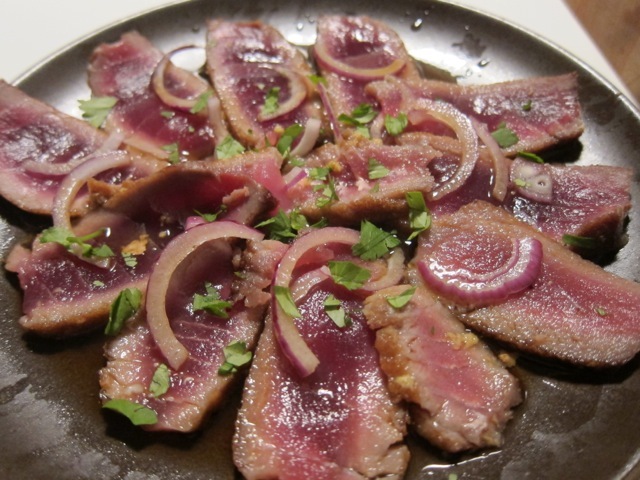 I seared the tuna on both sides for a couple minutes, sliced up some red onions and cilantro and poured ponzu sauce over it. 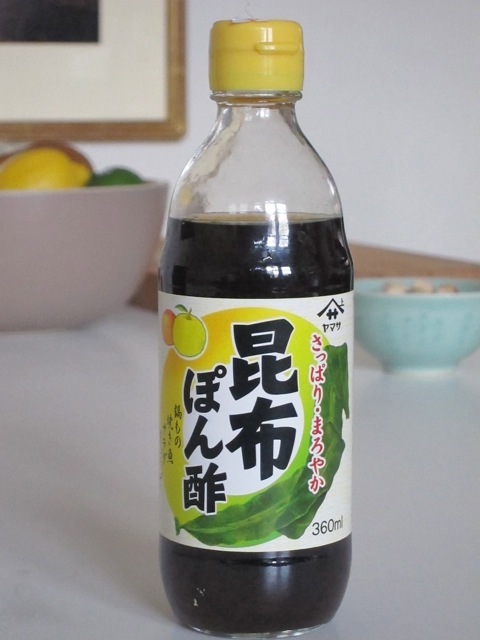 A few days ago I was at Sunrise Mart in the East Village and bought the bottle that had the most Japanese writing and the coolest design. 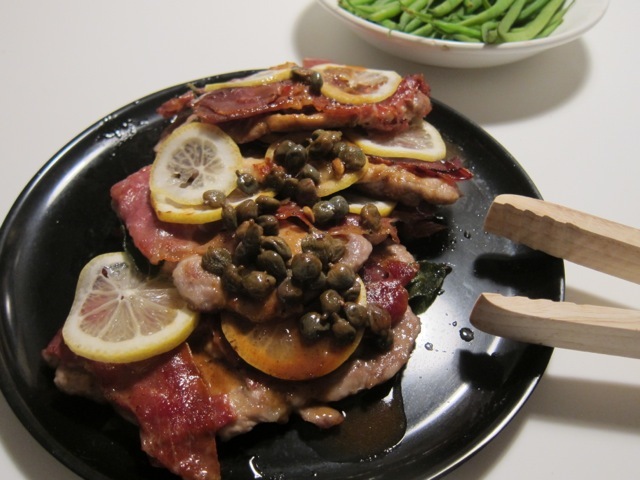 Kim and Phil came over for dinner tonight so I made Saltimbocca. 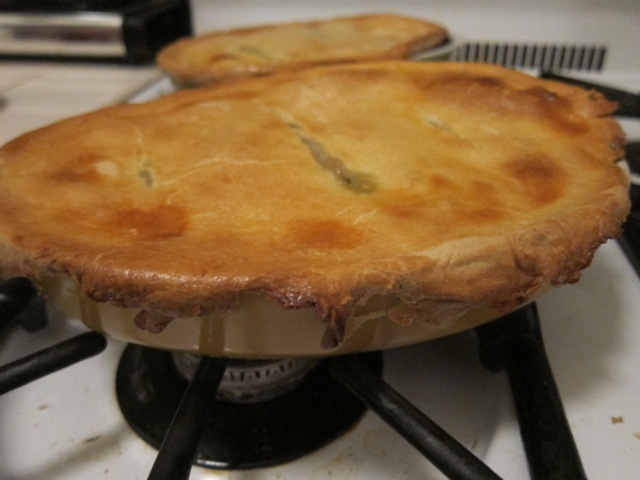 It's really easy and it's always a crowd-pleaser. 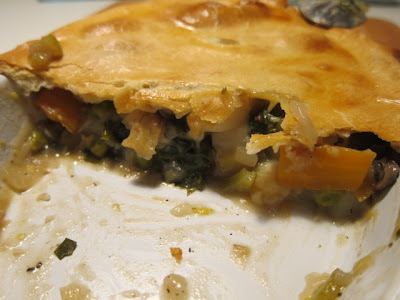 You can use chicken, veal or pork pounded really thin. The guy at Citarella pounded the pork cutlets for me. I dredge each cutlet in flour and then put a slice of prosciutto on each one with some sage leaves tucked underneath. You can also use a toothpick to stick it all together but it will stay stuck even if you don't. After the pork is lightly browned on each side, I make a simple sauce by squeezing a bunch of lemon juice in the pan to scrape up all the brown bits, add a little butter and some capers. Pour the sauce over everything and garnish with a few thin slices of lemon. I used these cool wooden scissors Ford brought me from Mexico to serve everything up with. There were lots of left-overs that I think will make a nice breakfast with some scrambled eggs and toast. Rockmeisha is half a block from my apartment but for a long time I never noticed it and didn't even considering going there. Amy told me they have excellent ramen, so Kim, Phil and I went there last night. It really is good. It's an Izakaya restaurant, lot's of small dishes and things to eat while drinking beer. I loved being there with my friends. I miss working. I liked creating environments, working with others and changing a space to become something it wasn't before I started. For the past few weeks I've been "working" on my apartment. I've always wanted to have a large table where people could eat, I could work on projects and sit with others and talk. I had this table made. It's big. It's got solid walnut legs and a Corian top (which is usually used for kitchen counters) I found this light at PW Vintage Lighting and today Tony installed it for me. 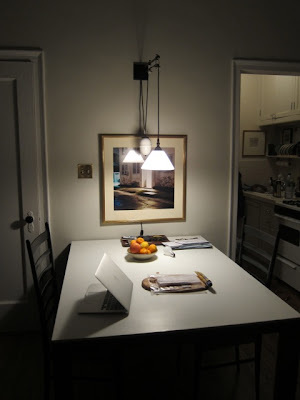 It's sort of like a pulley, it's counter-balanced so you can adjust the height of the light as you desire, and you can pivot it around to where you need light most. I bought two more chairs on Etsy that should arrive in the next few days. They don't match the ones I have but I think they'll look good. They are simple, white, wooden chairs sort of in the Windsor chair style. I really like it, I feel like I've changed the environment in my small apartment pretty drastically.